Other Common Names: Lyre-leaved sage, Lyreleaf sage, Lyre leaf sage, Lyreleaf Sage, Cancerweed, Wild sage, Meadow sage. Germination: Easy. Sow in late summer or early fall. Can start seed inside 6-8 weeks before planting outside following last frost. Seed germinates at 20�C, provide light (NOT heat lamp) and do not cover seed. Just press seed into soil surface. Will usually germinate in 1-3 weeks. Do not over-water soil when starting this seed. Notes: In folklore, it is said to cure skin cancers. Also well known to remove warts. 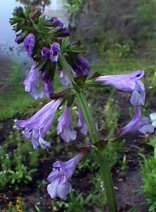 SALVIA LYRATA. Cancer weed is a member of the genus Salvia. Plants from the genus Salvia are well known for their medical properties. In fact, the Latin root of "Salvia" is salveo, which means "to heal." The old timers used this plant as a skin cancer cure, by applying the leaves as a poultice to the affected area. In fact, it is well known, even now, to remove warts in the same way. Also, this plant offers a beautiful array of delicate pale blue flowers when it blooms. Currently being screened for use as a flavoring agent. Reseeds readily, and will easily naturalize itself.